The end of September will be very exciting for the North Central Louisiana Arts Council, as the Artmobile will be on location in two of its parish service areas. What’s the Artmobile? It’s the best thing on wheels! The Artmobile is currently one of the few mobile gallery programs in the country and is the perfect source of arts exposure for schools and communities. Housed in an 18-wheeler, the art museum travels with a professional arts educator who guides students and adults through the collection. This year’s exhibition, Weird and Wonderful, will allow visitors to explore art, culture, history, language, science, and math through portraits and landscapes of abstract art. An educator’s guide will be provided to groups before their tours in order to make the most of the experience, both before and after. Tours of the Artmobile are free and offer a great opportunity for families to explore and interact together. NCLAC is a non-profit organization dedicated to fostering opportunities for creative expression and establishing a strong presence of the arts in the community. We were awarded a $4,000 grant from the Plum Creek Foundation to assist in providing funds to bring this touring interactive museum from the Arkansas Art Center. The Plum Creek Foundation supports non-profit organizations that improve the overall quality of life in the communities where Plum Creek operates. Union Parish and Jackson Parish are in the coverage area of NCLAC as well as Plum Creek, so the pairing was a perfect fit. NCLAC brought the Artmobile to the region in 2008, in partnership with the Lincoln Parish Library, through the Louisiana Decentralized Arts Funding program. The upcoming visit will be in Farmerville, September 18-22, and Jonesboro, September 25-28. NCLAC is partnering with the Union Parish Library for the tour in Farmerville, and the Jackson Parish Library for the tour in Jonesboro. Both libraries are scheduling visitors’ groups for the week, so as to maximize the impact of the exhibition for the communities. Groups of 20-25 people are being organized for tours of approximately 30 minutes. Stephanie Herrmann, Director of the Union Parish Library, has scheduled schools, churches and other civic organizations to visit the location in Farmerville. The Artmobile will be in the Brookshire's parking lot adjacent to Plum Creek and in front of D'Arbonne Woods Charter School. This location will be easy and accessible for the entire community. Angela Holder, Program Coordinator at the Jackson Parish Library, is scheduling tours for the Jonesboro visit, which will be on site at the library. They have special activities planned for children, tweens and teens. 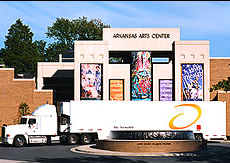 “We are pleased to be included on the Arkansas Center for the Arts Artmobile’s schedule for Louisiana. This gives our patron’s access to fine art and provides an exceptional visual art experience that many of our patrons would not otherwise have,” said Crystal Gates, Jackson Parish Library Director. The traveling art museum will be a not-to-miss experience. We hope that residents of the entire region will take advantage of the unique opportunity to see the artwork on board, and to experience the wonderful world of the arts. For information on scheduling your group’s visit, call Stephanie Herrmann at the Union Parish Library, (318)368-9288, or Angela Holder at the Jackson Parish Library, (318)259-5697. Ribbon cuttings will be held on site in Farmerville, September 10, and in Jonesboro, September 25. For more information about NCLAC and its programming, call our office at (318)255-1450.